Lassen County publishes a full page article on Briar Tazuk's lawsuit. When the lawsuit was dismissed, the Lassen County Times writes a small article.............. slight prejudice and bias ........? Dyer Mountain Associates have made no commitment to LMUD for its power. The DMA can self-generate or sign-up with PG&E. LMUD coincidentally annexed the Dyer Mtn. area in 1997 when Frank Cady was both LMUD's attorney and Dyer Mtn. Associates attorney. Dyer Mtn. Resort was approved by the voters in 2000. The County held a public hearing for the Dyer Mountain Four Season's Resort EIR, at the Westwood Community Center. The meeting hall was packed 15 minutes before the meeting started. It is estimated that over 200 people attended this hearing. The presentation was well organized and gave the public an opportunity to list their concerns. Concerns were voiced on the waste water treatment plant, police needs, water sheds, noise and traffic. The County took the public concerns into consideration and will include them in the final EIR. No questions were answered at the meeting. 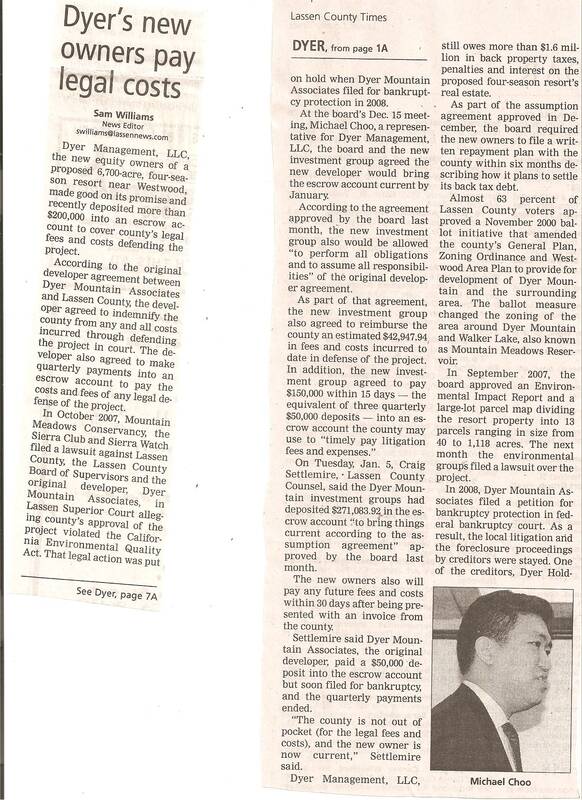 Chapter 16 of the Dyer Mountain EIR deals with the resorts utilities. 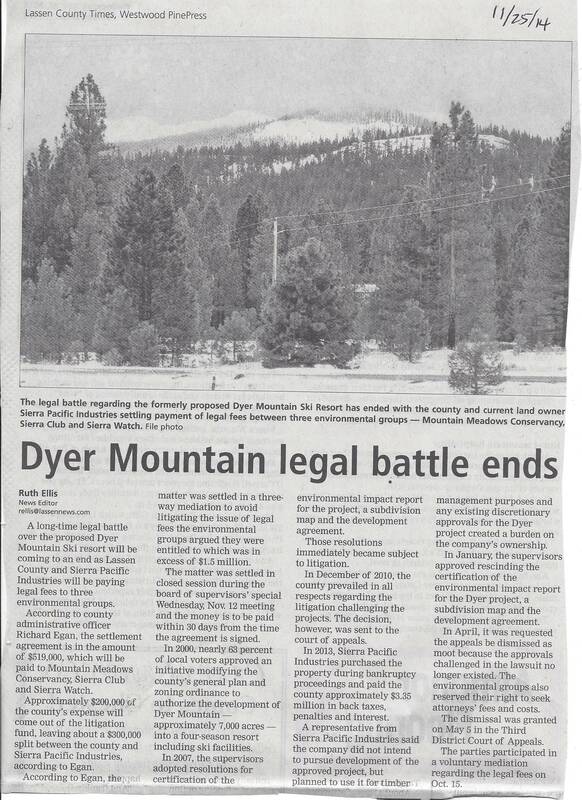 The report indicates that the Dyer Mountain Associates are in discussions with LMUD for the electrical infrastructure. Frank Cady was the attorney for Dyer Mtn. Associates and is now suddenly LMUD's General Manager.